A million years ago, while the earth was still cooling, the California Highway Patrol made the decision to switch away from their .357 Magnum caliber revolvers to a modern semi-automatic pistol. In mid-1990, CHP officially selected the 4006 from Smith & Wesson as their duty, and 25 years later it’s still soldiering on in the holsters of over 7,500 sworn personnel. As recently as 2009, CHP authorized officers to switch over to the 4006 TSW variant, which incorporates a rail under the frame of the gun to mount a weapon-light. All of the 4006s feature fixed Novak night sights, a DA/SA trigger, and an 11+1 capacity. 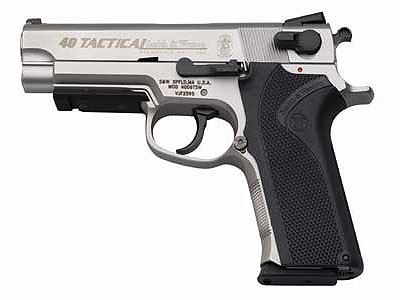 Smith & Wesson still manufactured new 4006s until as recently as 2011, presumably to support the CHP’s need for pistols. The last time I spoke with Smith about the CHP contract, back in 2012 they indicated that they also still produced small runs of parts to support CHP’s guns. There are quite a few factors that have contributed to the 4006’s long service life with the California Highway Patrol. For me, I find the 4006 is one of very few pistols chambered in .40 S&W that I actually enjoy shooting. The all metal construction goes a long way towards mitigating the annoying recoil impulse associated with .40s in polymer pistols, and as a fan of the DA/SA system, I find that the triggers tend to “shoot in” very well. They are one of the most shootable .40s on the market, which is part of why I think CHP has stayed with them over the years. They’re also incredibly durable and reliable. One of the reasons 3rd Gen S&W pistols are popular among a certain set of enthusiasts is because they’re built like friggin’ tanks. You can beat on these guns for days and they’ll just keep running along. In my experience with the 3rd Generation Smiths, they just work. That’s an excellent reason to stick with a duty gun, especially one that’s going to be exposed to climates that can vary as widely as California. One officer could have his gun exposed to salt spray from the ocean, another to mud and rocks in the mountains. Lastly, I’d be remiss if I didn’t mention cost. California really doesn’t like to spend money at the state level on LE, and switching 7,500 cops over from one platform to another would involve an enormous expense, which would likely only be driven up by California’s noxious professional bureaucracy. Since that isn’t an expense they’re going to want to incur, it’s probably a good thing that the 4006 is an excellent pistol. 25 years of service with one agency is an impressive record, but the Smith & Wesson 4006 is an impressive pistol that has proven its worth time and again in the service of the nation’s largest state police agency. With it’s reliability and durability well established, we can expect to see the 4006 riding in CHP holsters for some time to come. OOOOOOH, I love 3rd Gen S&W Pistols!! I got gobs of Spare parts!! I still have two complete Uppers kicking around!! One more feature, it had a Bobbed Hammer!! The CHP is using an unsafe pistol. It’s not on the roster. Bring that up to Gov Moonbeam!! One quibble: The CHP was never issued a .357 revolver. They were issued the S&W Model 68, a six-inch stainless .38 Special revolver that you can think of as either a stainless Model 14, a six-inch Model 67, or a .38 six-inch Model 66 (which it basically was). Model 68s are very rare; I don’t know if they were ever offered to the public, and I never heard of any that were not sold to LAPD or CHP. By the way, I like the 4-number Smith autos, too. I could have sworn that CHP issued Magnums back in the day. A bit of digging shows that they did prior to the Newhall massacre, where troopers were issued .357s but given the option to carry .38s or .357s in their guns. After Newhall, CHP standardized on .38s. For some reason, .357s never caught on in California. You’d think an outfit that only worked the road would want something a little more penetrative than .38 Special (that’s one reason the Illinois State Police went to the 9mm in 1967), but CHP stayed married to the .38. If you ever find a Model 68 for sale, snap it up. They’re like hen’s teeth. I used to work with a lawyer who retired from the CHP. He was a patrol officer in the revolver days, and I think was retiring from police work just about when they switched to semi-autos. He once told me that the .38 Special was indeed standard issue, but an Officer could buy his own .357 revolver (IIRC, Smith or Ruger, pretty sure there was an approved list of models and configurations) and duty gear, even to have the gun “tuned” by a list of approved ‘smiths, and submit those to the CHP’s head armorers and firearms training types. Then, pending approval and qualification, he’d be OK to carry his .357 on duty. I don’t remember if he said the Patrol issued .357 ammunition, but I believe so. He switched to a Ruger, probably one of the Six series but I forget which one, because of his dissatisfaction with the issued .38 load. This guy called it the “safe and sane: guaranteed not to hurt, kill, or maim” load. ISTR it was a relatively light-for-caliber bullet at not-outstanding velocity. Your post is kinda timely. I remember when CHP went to the 4006. I believe it was the first agency (at least the first large one) to adopt the .40 S&W cartridge. Just the other day I was wondering what they carry today and what happened to their old Smiths. (Yes, I have a weird brain.) Now I know. Last year, I picked up a 5946 for $300- later, a Beretta 92D Centurion for the exact same price. One nice thing about the gun derp, it keeps the price of the nice DAO guns down. Where did you get yours, Caleb? Also, I’ll put in a plug for the Daewoo DH40, the .40 version of the venerable DP51. I found one cheap and it is my second favorite .40 (first is a SIG P229). It could be worse. The California Department of Corrections only recently began to transition over to Glocks. Most of the their officers still carry revolvers. Granted, they are stationed at a prison, but by law they are considered peace officers, the same as police, sheriff’s, and CHP. On a side note, I thought I heard that CHP would be switching over to the M&P. Up north, the RCMP, Dept. of Fisheries and Oceans, and BC Corrections are still using the DAO S&W 5946. There are ~20,000 sworn members in the RCMP, not sure about DFO and BCC. The rumor mill has been saying for years that the RCMP is having problems sourcing parts, and that when the BC Sheriff’s service switched to the M&P, they gave or sold their 5946’s to the RCMP as spares. I think S&W is heavily favoured to provide the next service pistol to the RCMP, whenever they eventually get around to replacing them. If you think your Modular Handgun selection is going out of hand, just remember that Canada still issues 1944-manufactured Inglis Hi-Powers to its soldiers, and hasn’t been able to secure a contract to replace them. 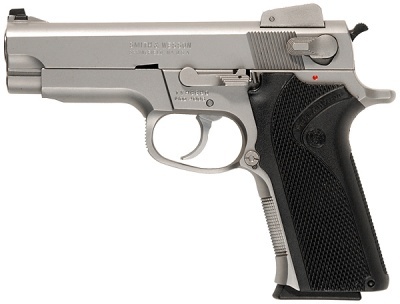 The replacement program stalled in 2011 when no manufacturers submitted bids, because they thought (correctly) that the CF’s requirement that 10,000 pistols be produced under license by Colt Canada was outrageous. Military contracts love to put that ‘made in Canada’ sticker on the side, even when it makes no economic sense and usually costs twice as much. You know, I completely forgot about the RCMP still carrying 3rd Gen Smifs. I did know about the Hi-Powers however, and I remember following with some interest the travails of Canada’s handgun replacement program. I’m not surprised that it fell apart though. Is it bad however that it makes me happy inside to know that there are still bros doing operational work with Hi-Powers? Our procurement is seriously flawed. I really don’t think it *should* be this hard for a country to purchase off the shelf replacements, especially since there are so many excellent pistols to choose from, but I scrutinized the General Service Pistol requirement sheet back in 2011 and a lot of technically acceptable pistols were disqualified because they didn’t meet a requirement that they had to be in service with a NATO member’s military for at least two years. I was disappointed that it fell through, but not at all surprised either. It’s odd that we managed to finally secure the Ranger Rifle replacement, which also initially fell through around the same time as the GSP program, but I guess someone revived it and pushed it through. I’m almost shocked they picked a decent rifle as a replacement, too. My old C.O. is the current minister of defense, so I’m hoping he can crack the whip and push along some real improvements, despite the handicap of the government he serves under. I love the history of the Hi-Power (I love that they were built by what is now Whirlpool Canada) and I didn’t mind it when I was carrying one during my time in, but I would have preferred something newer if I had the choice. Our pistols had a lot of reliability issues stemming from bad magazines, and spares were hard to come by. I probably would have gone for a P226 instead, but they generally weren’t available and I just carried my C7A1 / A2 instead.